For over two decades, Baltimore-based painter Jo Smail has ceaselessly reinvented her approach to art-making. Whether it’s pink paintings from the 1990s that walk in the footsteps of Mary Heilmann, collaborative drawings with William Kentridge, or, more recently, abstractions informed by photographs of Italian architecture, Smail never repeats herself. Rather than rest on her laurels and pursue a single creative vision for decades, Smail has nurtured an exciting artistic practice that thrives off continuous change. In The Past is Present, curated by Goya Contemporary director Amy Eva Raehse, Jo Smail confidently expands her painterly approach by marrying tidbits of personal history with an accentuated use of collage. 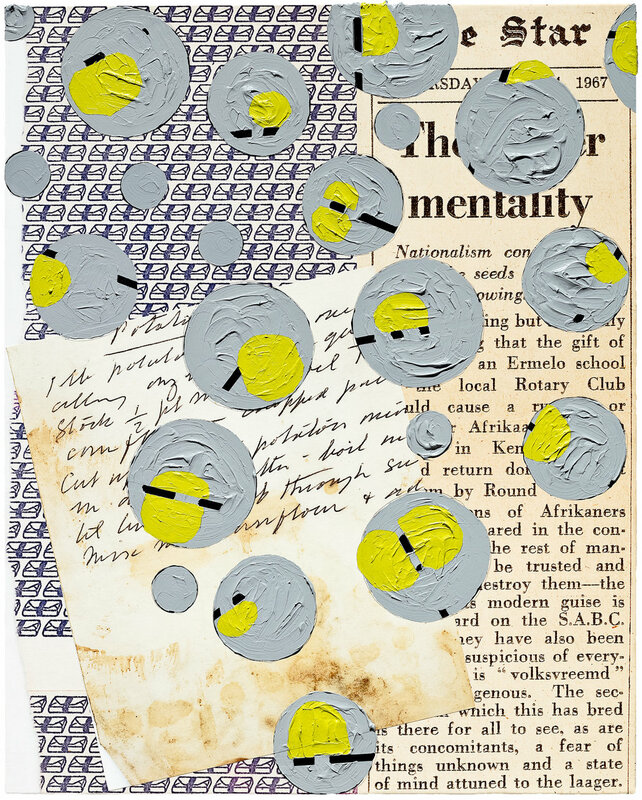 By incorporating personal content such as digitally scanned images of newspaper clippings, cooking recipes, antiquated advertisements, postage envelopes, as well as hand written notes and letters onto stretched canvases, Smail draws upon her South African upbringing and places the historical significance of these narratives front and center. Jo Smail, A Labor Crisis, 2017. Acrylic, paper, and archival print on canvas, 50 x 40 in. Courtesy Goya Contemporary. 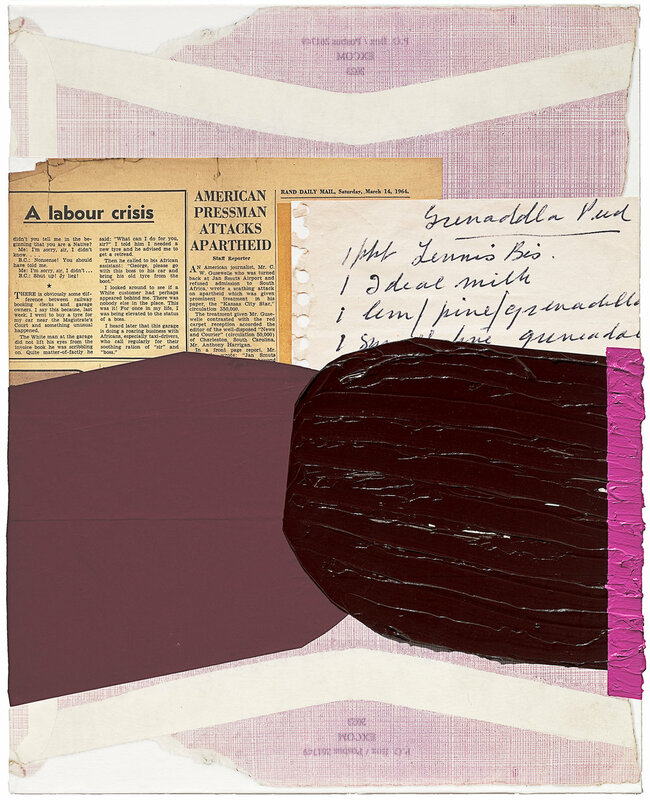 In A Labor Crisis (all works 2017) a collaged image of a 1964 newspaper clipping, referencing the injustices of South African apartheid, is juxtaposed with a collaged image of a hand written list that is partially obfuscated by acrylic paint that rests on the surface of the painting like icing on a cake. 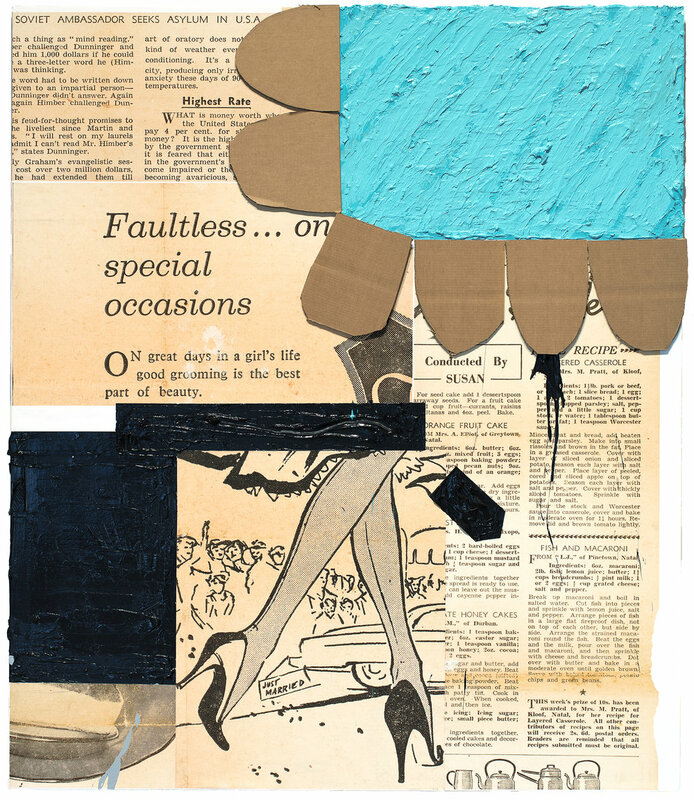 Similarly, zones of thick black paint obscure collaged text and images in Crossed Legs with Daisy, a sixty by seventy inch painting that draws the viewer in with evocative blue paint residing in the upper right-hand corner. The painting (along with Choosing A Nose and Climbing and Gathering in Durban, South Africa) uses cardboard as a collage material to further augment Smail’s painterly marks and autobiographical content. The hardly altered cardboard not only functions as an unexpected element in the work, but also helps the painting sidestep highbrow associations. Thick paint on collaged content abounds in every painting in the show, but occurs most notably in The Laager Mentality, a whimsical fifty-by-forty inch painting that features twenty-two gray circles that appear to float on top of three collaged prints. Here, Smail explicitly explores the tension between legibility and obfuscation by burying portions of the newspaper’s text with thick paint. Jo Smail, Crossed Legs with Daisy, 2017. Cardboard, acrylic and archival print on canvas, 60 x 70 in. Courtesy Goya Contemporary. In addition to the eleven paintings, the exhibit features just under fifty miniature collage constructions in the main and back gallery. They’re arranged in rows and are mounted on small wooden panels which protrude slightly from the wall. The linear arrangement of these pieces gives a logical structure to their otherwise unruly format. Unlike the paintings, which conform to the conventional rectangular format, the collages are delightfully quirky due to their irregular shape. Saturated pieces of colored paper, thick globs of acrylic paint, tattered newspaper clippings, and handwritten notes and recipes dynamically jut off in various directions to form densely packed works which are as serious as they are playful. Upon first glance, collages like Rand Daily Mail, Saturday, 1964 and Uniforms for Whites and Non Whites may appear to be merely cute works on paper ruled by improvisation, but upon further inspection, the politically charged subjects are revealed, thus compelling viewers to grapple with the implications of apartheid. Considering the title of the show, it’s fair to assert that Smail is attempting to draw a comparison between the racist nature of South African apartheid and the decisive rhetoric used by white supremacists in the United States’ increasingly fragmented political climate. Moreover, the works within Smail’s new series speak to the fact that historical narratives continue to repeat themselves within contemporary contexts. Although Smail’s work can be appreciated without being privy to her background, knowing that Smail grew up in South Africa during apartheid, and that she fled the country “before any sign of democracy,” facilitates a deeper understanding of the personal and historical references embedded within the work. Jo Smail, The Laager Mentality, 2017. Acrylic and archival print on canvas, 50 x 40 in. Courtesy Goya Contemporary. What is striking about Smail’s new paintings is how radically different they are in comparison to the art featured in her previous one-person show, Leaning Over the Edge of the Moon. Presented in that show were paintings and photographs Smail had taken during a trip to Italy. While photography asserted itself as a welcome companion to Smail’s painting practice, the photographic content wasn’t directly integrated with the paintings. Instead, the photographs hovered above the paintings on the wall, creating a vertical diptych. Fast forward three years and we now find Smail physically combining photographic content, gathered from the attic of her life, with the paintings’ surfaces. In the accompanying artist statement for The Past is Present, Smail describes her process by succinctly stating, “I turn the newspapers over and discover my past. I scan it all, print it out and then I play. The thick paint is my now, the rest is my history.” Notions of discovery and play have been present in Smail’s work for years but are now heightened in this new series of paintings and collages. By deliberately coupling her intuitive, painterly style with social, political, and personal content that acknowledges her past, Smail has successfully conjured “magic out of the little leftovers of a life” and has created a fresh body of work that is her most captivating. Jo Smail: The Past is Present was on view at Goya Contemporary in Baltimore from September 13 through November 7, 2017. Andy Martinelli Clark is an emerging visual artist and writer currently pursuing a BFA in Painting at the Maryland Institute College of Art (MICA).